This Spicy White Bean Pumpkin Soup is sure to warm you up on these chilly Fall evenings. It’s deliciously creamy and packed with nutritious flavor from butternut squash, white cannellini beans, and homemade harissa. Yum! It’s been raining again, a lot, and that always makes me crave soup. Soups are infinitely comforting. There really is nothing like slurping on a steaming bowl of soup when it’s wet and miserable outside. Add a touch of spice and you have a double dose of heat. This weekend, I enjoyed creating this delicious and spicy White Bean Pumpkin Soup. 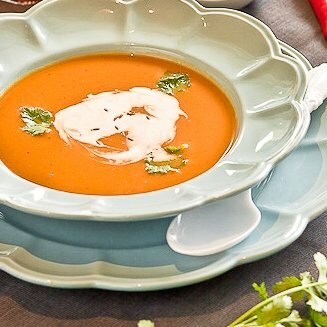 The spices in this pumpkin and bean soup come from what is commonly known in the Delicious Everyday house as “Magic Sauce”. Magic sauce came about when I needed Harissa for recipe I was putting together, and couldn’t find harissa paste at any of the supermarkets or grocers I visited. So I had to come up with my own version. I looked through a ton of recipes and found that the main ingredient was chili peppers. I used a mix of red bell peppers and red chili peppers until I found the right spice level, and it worked out beautifully. 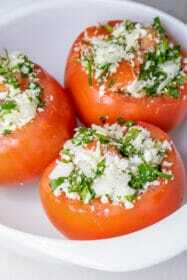 So beautifully in fact, that it’s since shown up in a number of recipes such as Spiced Pumpkin and Feta Tarts and Feta & Tomato Tartlets. Knowing how wonderfully versatile this homemade harissa paste has proven to be I thought I would apply it to a soup and see how it turned out. Of course, if you want to make this recipe even simpler to prepare, you can always use store-bought harissa. Let’s Make Spicy White Bean Pumpkin Soup! The Spicy White Bean Pumpkin Soup is made from a simple combination of vegetable stock, pumpkin, white cannellini beans, onions, homemade harrisa paste, and coconut milk. The first step is to make the “magic sauce”, or homemade harissa paste. While there are quite a few ingredients – all you have to do is blend everything together in a food processor. I used red bell peppers, red chili peppers, salt, cumin, coriander, and paprika.You can adjust the spice level to your personal taste. Add more chili peppers if you like more heat, or substitute more bell peppers to tone down the spiciness. Then, you just cook all the veggies on the stove top until they are nicely softened. Mix in the vegetable stock and let it all simmer together. Toss the white beans into the soup for some added protein! Honestly, the hardest part of this soup recipe is peeling the pumpkin! I personally like this microwave trick to make the process faster. And if you can’t find fresh pumpkin, you can substitute butternut squash. It will be just as delicious. When the soup is finished cooking, use an immersion blender to blend it all together until it’s nice and creamy. This step is optional. You can leave the soup chunky if you prefer it that way. Top the soup off with a drizzle of coconut milk and a sprinkle of cilantro. This White Bean Pumpkin Soup is bursting with flavor from homemade harissa, pumpkin, and white cannellini beans. To make the "magic sauce", toast the cumin and coriander seeds in a frying pan over medium, heat until fragrant. Set aside to cool. Once cooled add to a food processor and process until a powder forms. Add the remaining ingredients and process until you have a smooth paste. Decant into a clean jar and refrigerate. To make the soup, heat a large saucepan over medium heat. Add the olive oil and onions along with a pinch of salt. Fry the onions until golden. Add 2 tbsp of the "magic sauce", and cook for 1 minute or until fragrant. Add the pumpkin and toss in the onions and sauce and allow to brown slightly. Add the vegetable stock and beans. Bring to a boil, before reducing to a simmer for 10 minutes, or until the pumpkin is tender. Add the coconut milk and cook for another 5 minutes. Remove the saucepan from the heat and, using a hand held blender, blend the soup until smooth. 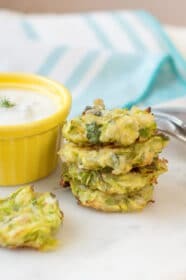 Serve with a drizzle of coconut milk and fresh cilantro. Lovely soup and the magic sauce is just that. as in place of tomatoe paste in chicken parmigiana. It is very versatile and much milder than Harissa which I find to be too hot. Excellent combination of flavours and the magic sauce gave it a nice lift. Well done. I always add coconut milk and chilli to my pumpkin soup but the magic sauce would make it that much more flavourful, good on you for making the paste! I tend to use coriander a lot to add a delicious zing to soups and other dishes – BLT with coriander instead od letucce is the best thing in the world! RT @ledelicieux: Did you miss Friday’s post? 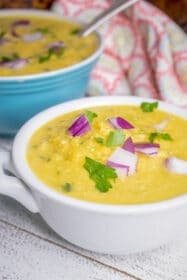 Spicy Butternut Squash & Cannellini Bean Soup http://t.co/NlrFcdet deliciously comforting & vegan. 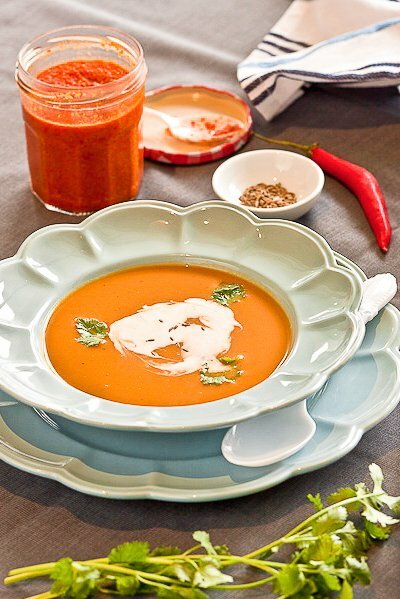 I love soup…and this one is gorgeous! I love that it has a bit of spice, too…so yummy! Magic sauce! I have a “magic” dressing for steamed vegetables, it’s just grated tomato flesh, lemon juice, and olive oil, but it lifts anything I put it on! This soup looks wonderful! So comforting and perfect for this weather. 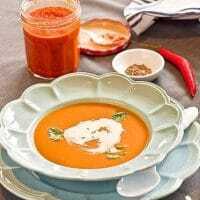 I love pumpkin and this soups looks perfect for the season. I love the name magic sauce and anything spicy good will be my favorite. I am just loving this agave nectar. I totally replaced my sugar with coconut palm sugar and agave nectar. They are low glycemic. What more do we want?! Yum I love pumpkin soup hehe but hahaha i don’t think i’ve successfully made it at home before, I always burn it or somehow manage to destroy it. Interesting! I’ve never had squash with beans, but it sounds like a lovely combination, and I adore the color on your creamy soup! Oh, it’s colder here today too, and one of those soups would be so good! Great post! 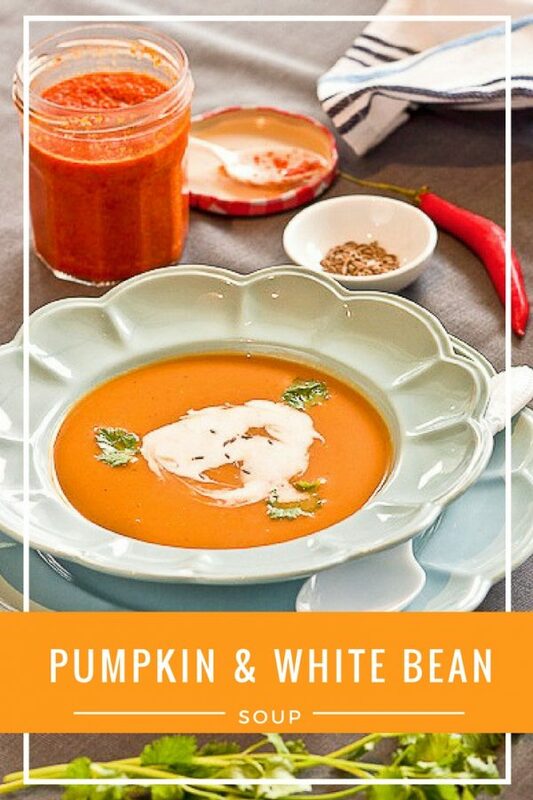 Lovely recipe, I’ve been making pumpkin and white bean soup quite a bit lately but really like the addition of your ‘magic sauce’ and coconut. My fav sauce – homemade siracha hot sauce, I go for the spice every time! And yet another set of dishes for me to covet – gorgeous! Hehe thanks JJ 🙂 As for the dishes I picked them up the night before and couldn’t wait to put them to good use right away. I must try your “magic sauce” as I have a hard time dealing with too much heat in my food but I still like a hit to liven up the flavors. I love the idea of ‘Magic sauce’ and if it tastes anything like harissa then I know I’d love it! The colours in this dish are absolutely gorgeous. The weather has just started to get cold today :-(. Definitely soup weather. A marvelous soup! Great flavors, colors and combo.